- The Mojano Parking is open 24 hours a day. - The ticket must be paid at one of the automatic cash tills before going to your car. - At the exit you must insert the paid ticket into the slot that will open the exit barrier. - Always bring your ticket with you. During closing hours it is only possible to enter the parking lot by inserting your parking ticket to open the gates. - These regulations are posted at the entrances and on Level 0. 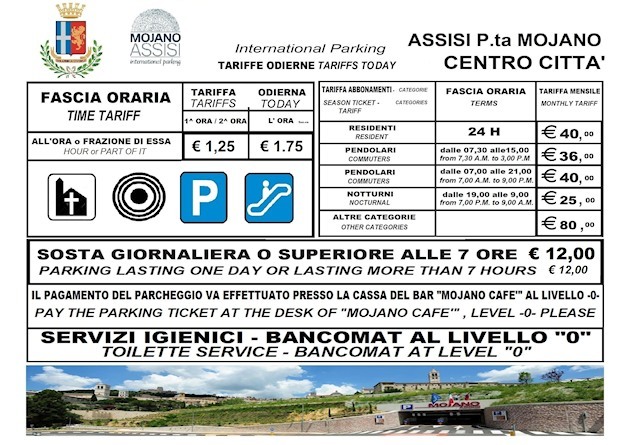 Online parking reservation in the hearth of the city of Assisi. Upon your arrival in the city don't risk not find a parking for your car. Book here your Parking ! This page has been seen 16,007 times.